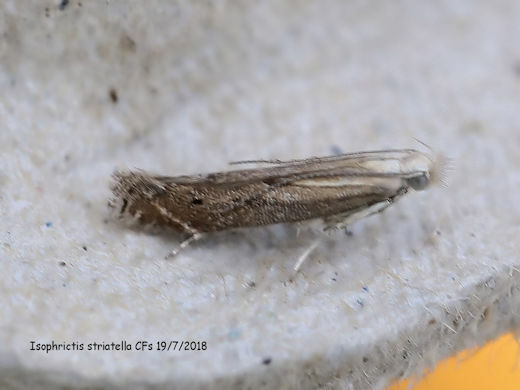 On the 19th of July I found a Isophrictis striatella mico moth at Caldene fields. The moth is only about 6mm in length and was nearly overlooked. It is predominantly a southern species but is gradually moving north and at present is rare in west Yorkshire. I contacted Yorkshire Moths for a second opinion who confirmed the sighting. So great news for our area! Updates: No reports of any Red Kites seen in and around our area at present. Small and Large White butterflies are doing really well at the moment but some other butterflies numbers like the Small Copper and Peacock are well down at present. A female Southern and Brown Hawker dragonflies were at Caldene Fields on 26/7. They were possibly looking for water to lay their eggs as the pond at Raw Nook NR has completely dried up due to a lack of rain and is causing many problems for local wildlife. A juvenile Willow Warbler and Chiffchaff were at the top end of Caldene fields on 26/7 suggesting that they have moved from their breeding area to gain weight before migrating in the autumn.